Russian President Vladimir Putin has sought to ease fears over his country’s economy, insisting that the dramatic fall in the ruble will stabilize. 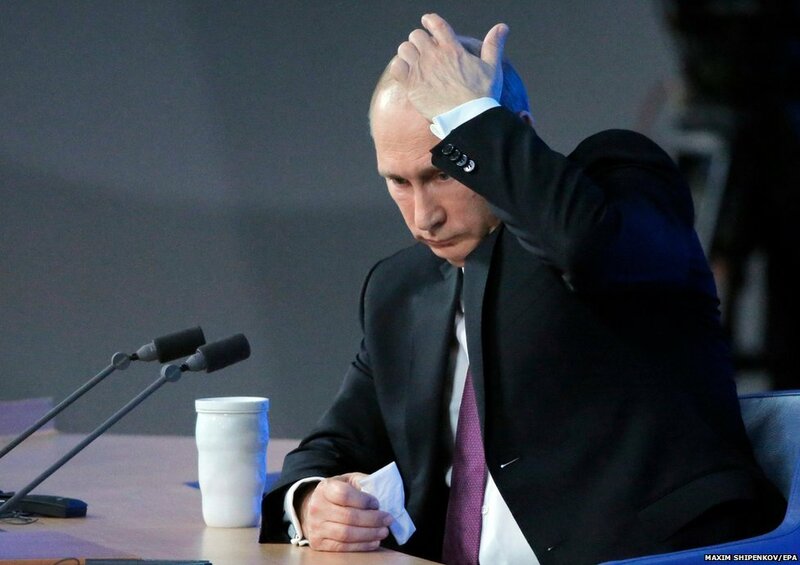 Speaking at his end-of-year news conference, which lasted over three hours, Vladimir Putin blamed “outside factors” for the currency hitting an all-time low. However, he admitted Russia’s central bank could have acted more swiftly. Russia is on the verge of recession due to falling oil prices and sanctions over its role in the Ukraine crisis. However, Vladimir Putin denied pursuing an “aggressive” foreign policy and accused the US and EU of conspiring to weaken Russia. He accepted Russia had failed to diversify its economy for the past two decades and relied too heavily on its oil and gas exports. But the president insisted the nation’s currency reserves were sufficient to keep the economy stable, saying the central bank should not “burn” its $419 billion reserves. “I don’t believe you can call it a crisis – you can call it what you like,” he told a packed conference hall. If the economic problems persisted, Vladimir Putin said, the government would have to “reduce social spending and future growth”. Although the ruble strengthened on Thursday morning, it has taken a battering in recent days. The currency’s collapse came after a drastic 6.5 percentage point rise in Russian interest rates to 17%. Earlier this week, there were reports of Russians flocking to the shops to spend their cash before prices shoot back up. Many were said to be buying cars and home appliances. Vladimir Putin estimated that Western sanctions, put in place after Russia annexed Crimea from Ukraine in March, had accounted for roughly 25-30% of the ruble’s troubles. On Ukraine, he said he was hopeful the conflict could be solved through peace talks. Vladimir Putin urged the Ukrainian government and pro-Russian rebels in the east of the country to conduct a quick “all for all” prisoner swap before Christmas. Ukraine and the West accuse the Russian president of sending troops to fight with the rebels, but the Kremlin denies the allegations. Vladimir Putin accused the US of hypocrisy, saying that Russia has just two military bases outside its borders while there are American bases “all over the world”. Meanwhile, the EU approved further sanctions against Russia on December 18. They target investment in Crimea and oil and gas exploration in the Black Sea and come into force on Saturday. “We are doing this because the EU has said the annexation [of Crimea] is illegal and what we’re doing is part of implementation of non-recognition of this policy by Russia,” EU spokeswoman Maja Kocijancic told reporters. President Barack Obama is also expected to sign legislation this week authorizing new economic sanctions on Russia.